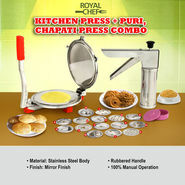 It is a good product in this price .quality is good and it is very useful for kitchen. Very good product. Very much recommended to buy for your kitchen. Bought it for my mother, she really loved the product. Thanks Naaptol for this amazing combo. Worth the purchase. High quality, easy operation and function. Highly recommended! Go for it. Worth the pick. Truly amazing. Really impressed with the quality of the product, also it was delivered on time. Worth the purchase. works really great, makes my cooking easier and hassle-free. Worth buying.